Did you vote in Belfast’s latest election? Vote online? Went along to the Lagan Lookout to cast your ballot in person? Up against competition from the upside-down wind-chime and a giant spoon, the steel squiggle has won its place in the newly tarmacked Cornmarket Arthur Square. Spirit of Belfast won with 46.6% of the vote – a sizeable mandate in these parts – leaving Dancing Tree on 28.8% and Phoenix Rising just behind on 24.6%. 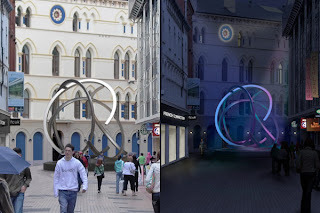 Spirit of Belfast - four curved stainless steel squiggles, complete with “a ribbon of light provided by very energy-efficient light emitting diodes” whose “intensity, color [sic] and movement will be programmed as called for by events, the time of day ... or special celebrations within the city”. It intends to become “the hearth of our city centre”, drawing people to its interactivity as it weaves together steel and reminds of us of the fabric (linen) of our history. "I wanted the coloured lighting to reflect the texture and lightness of linen, while the metal reflects the strength and beauty of shipbuilding." Hopefully there will be some money left over to rip up the tarmac and put down proper paving again. Update - Thu 6 Mar - and they got the paving fixed just in time for the opening of Victoria Square ... though it'll be partially ripped up again to install The Squiggle. Update - September 2009 - It's finally being installed. Update 11 February 2008 - Apple now listing some vacancies for their Belfast store on their UK jobs site. Update 6 March 2008 - Victoria Square now open ... though you'll need to wait until June/July for the Apple Store to start trading. In a post today, goodonpaper (via ifoAppleStore) reports that an Apple Store is likely to be filling unit UG5 in Belfast’s Victoria Square shopping / residential / cinema / entertainment complex. Apple’s opening will be after the main Victoria Square opens its doors to the public in March 2008. 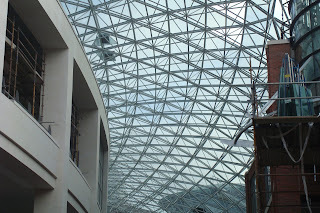 But the traditional Apple Store glass look will certainly fit the look of Victoria Square! Update 16 December: it's now been broadcast - and I wrote another post about it. I was a big fan of the Manchester Passion ... a retelling of the Easter story using contemporary Manchester artists and lyrics, and broadcast live from around Manchester city centre on Good Friday 2006. It was repeated this year on Good Friday, and it’s impact was still as strong. So expect to find Geoffrey Hughes playing the Angel Gabriel narrating the events, and Cathy Tyson cast as Herodia, a paranoid government minister “desperate to cling to power, orders a crackdown on immigration” directing events as they unfold live in Liverpool city centre. There’ll be familiar music taken from The Beatles, The La’s, The Zutons, and doubtless other bands whose names begin with “The”, performed by a live orchestra, and woven into the story line. Other sons and daughters of Liverpool will pop up with speke-ing roles, including Jennifer Ellison (an angel); Paul Barber (the landlord) and Andrew Schofield (a shepherd). And 28 students from Liverpool Institute for Performing Arts (LIPA) will be taking part, performing songs and working backstage in the huge production. If you’re in the area on Sunday 16th, head down to Liverpool’s William Brown Street (map) from 7pm to watch the event live. Certainly passes for creative and distinctive in my books! If you’re a book reader, or even if you’re just a book buyer, the nice people at IWOOT (I Want One Of Those) have a couple of gift ideas. 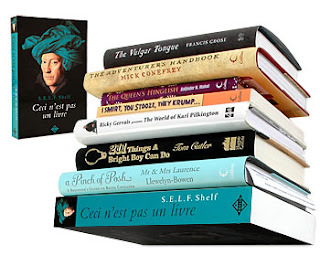 First there’s a floating bookshelf disguised as a French novel that screws into the wall - no visible means of support - and allows you to stack other books on top. Maybe it would allow you to get rid of the pile dominating your bedside table, or down on the floor? And if all else fails, there’s always Amazon gift vouchers! 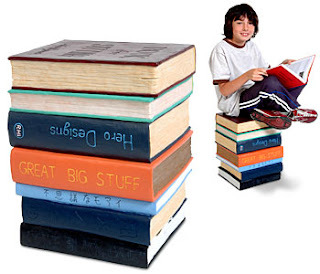 or the bookcases with in-built snug chair featured in an April AiB post. Was the Highway Code revised when I wasn’t looking? I don’t want you to think that I’m a stick-in-the-mud or trapped in the past, but this morning’s short commute into work was accompanied by a display of guerrilla driving extraordinaire. First, half way down the Belmont Road, someone in a 4x4 pulled out and drove 50m down the wrong side of the road before sharply turning in to one of the side roads (Ferguson Drive) near Gourmet Burger Bar. Managed to go through a red light in the middle of this manoeuvre too - but maybe being on the wrong side of the road the jeep was exempt? The oncoming traffic reached the same spot a few seconds after the reckless driver swung around the corner at speed. Then there was another outbreak of driving on the wrong side of the road when a taxi driver grew restless in the outside lane on the Albertbridge Road and decided to pull out and drive down the far side of the road before turning into Cluan Place. Again, they were being dazzled by oncoming headlights before they got around the corner. And a few seconds later, another taxi decided that rather than waiting for the traffic to move forward and allow him into the bus lane, he’d just mount the pavement and bump his way over, saving a few seconds in his no-doubt busy day. It’s as if the Highway Code was revised, and someone forgot to tell me? If all roads are to be filled with lunatics - particularly ones recklessly behind the wheels of taxis - maybe I should have stayed in bed this morning? PS: Why isn’t reckless spelt wreckless? I popped into a recently opened shop on Lisburn's Railway Street. The smell of smoke hit me as I walked in the door. I innocently wondered if someone had been having a puff on the doorstep and then breathed out their lungs as they came back into the shop. But then I noticed the overflowing ash tray sitting on the counter, and a similar sight in the back storeroom. Didn't notice a no smoking sign on the door either. Looks like Lisburn City Council have a way to go before the smoking ban is enforced by all businesses in their patch. Posts on the blog have been a bit sparse this week. It’s been a full on week, with lots of unexpected twists and turns, worry and relief. There was Tuesday’s trip up to Mallusk to drop my car off for an MOT service. Driving anywhere near Mallusk before 10 o’clock in the morning was a major mistake. And the closure of the Hightown bridge made nipping across to Jordanstown all the more cumbersome too. 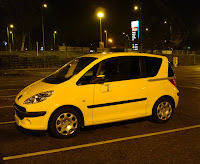 On Wednesday night I flitted across to Stansted, and picked up a hire car to drive to Ipswich. Pouring rain. It was a bright yellow Peugeot 1007. The yellow I can cope with. The 1007 was more of a problem. The doors don’t open out on a hinge. Instead they slide back along the side of the car. Slightly surprised by the unusual mechanism, I ho9pped into the car, and sat in the drivers seat, with the rain belting in the open gap where the door used to be. But could I find a button to trigger the door to close. While it’s a neat idea - and should save a lot of door prangs in car parks – the layout of the controls on the 1007 leaves a lot to be desired. Thursday morning found me talking in front of a lecture theatre. But knowing I’d be wearing a radio mic for most of the day introducing presenters and doing the links between the different talks following my session, I’d silenced my phone and taken it out of my pocket. Gets rid of that annoying doot doot doot over the PA. So I missed the call at noon telling me that my daughter was being admitted to hospital, and only picked up a text about an hour and a half later. Time to try and get back to Belfast earlier than the 21:30 easyJet flight that would have got me home sometime after 11pm. Making quick arrangements to get other people to cover the rest of the afternoon, made a hasty exit, got the earlier 18:30 flight, and made it to the hospital for 20:00. Of all the days to be aware. There’s a whole blog entry – could be a whole Nolan show! – describing this particular hospital’s car park policy. Imagine you’re a parent bring a child to Accident & Emergency. You park, go in, your child is examined, and is unexpectedly admitted immediately. You spend the night in the same bed as the child, looking after them and comforting them in a new and unusual environment. Problem is that your car is still sitting in the hospital car park. People come and visit, bringing their cars in and out, but yours is still sitting lonely and unloved. So when you’re discharged or are allowed to take your child home for a few hours, the hospital expect you to pay parking for the days that your car has unexpectedly been loitering in their car park. On top of caring for your child, you’re meant to organise someone to drive your car home – third party? – to avoid racking up charges. Oh, and there’s a rumour of an exemption certificate that will waive the charges. But neither A&E nor the wards seem to hand them out. They recursively point to each other. And the security team’s script just says no. Moral of story, get a taxi to A&E. It’ll work out cheaper if you’re admitted. But I can’t bicker too much. The staff provide an excellent level of care was good, and overnight the little one’s temperature slowly dropped off to a normal level, and other than popping in three times a day for injections of antibiotics, she’s enjoying being at home, and even starting to get an appetite back. And in amongst the drama, I got my car back from Mallusk – only took half an hour to get there, switch cars and get back home at Friday lunchtime. 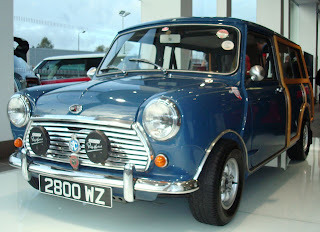 It passed its MOT, and its doors swing out like doors are supposed to! This week has been a reminder that the best made plans and schemes are easily thwarted. And a reminder that life is precious. Humans are built quite sturdy. But we do break. And it’s a reminder that trusting God isn’t a part time decision when times are rough, or success is on our lips, but a decision that needs to span every day, and every circumstance. Being a signed up member of the Secret Sainsburys club, and not being a big fan of Tesco, and I get a lot more post from Nectar than Tesco Clubcard. The letters and vouchers are incredibly customised, offering you savings off a slightly more upmarket version of the kind of goods that the retailer knows you buy regularly. Sainsburys/Nectar even send you a voucher for a free box of chocolates on your birthday. But I burst out laughing when I saw the notice at the top of the Tesco Clubcard letter. There, in the spot that advertises the Christmas trading options at your local Tesco store were the opening hours for their Ipswich Extra branch! Not Knocknagoney. Turns out that the only Tesco store I’ve bought anything in over the last six months was the massive Ipswich store beside the Toys’R’Us Copdock roundabout. So Tesco now thinks that I live in Belfast, but shop in Suffolk. Maybe I should call in again tonight when I’m over staying in the hotel next door and buy something to keep up the pretence. Isn’t data mining a wonderful tool. It rained. 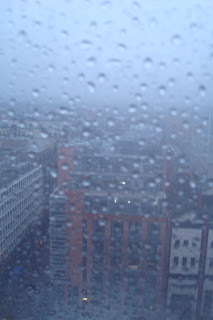 In fact, it poured. The condensation and raindrops made decent photography impossible ... and I can just hear Jett saying "Phew" under his breath as the last thing the internet needs is another pile of samey photos of the wheel appearing on Flickr! Despite the wind and rain, it wasn't as bumpy or rocky as some have described it. All the same, the view of the Cathedral Spire as you come over the top is astounding. A pleasant, repeatable experience, perhaps on a clear night when the lights are officially turned on and the market is buzzing, or maybe with a sandwich some lunchtime. Now the Belfast City Centre lights aren't due to be switched on until Tuesday night (20th at 6.30pm), but someone was obviously checking that the City Hall ones were all wired up properly. 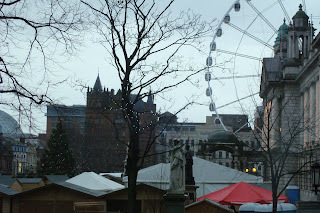 I'll bore you later with the compulsory photos from Belfast's Rickety Wheel later! I saw the film Hallam Foe back in September. Intrigued by the characters and the storyline – and spurred on by a comment from The Killing Moon - I ordered the book on Amazon. And I read it yesterday. Peter Jink’s novel Hallam Foe isn’t too thick (though the font size is pretty small), and I’d three quarters of the book read on the BD96 flight home last night from Heathrow, and finished off the rest before dropping off to sleep. The rare satisfaction of finishing a book in a single day (over two sittings)! The character of (film) Hallam played by Jamie Bell is straight out of the book. The early chapters were lifted into the screenplay with only minor changes (like the family home being in Peebles rather than the book’s Leicester). Having already seen the film, it was interesting to think about the differences in approach. The way that the screenplay had taken the ideas and circumstances of the book and had then adapted them for the big screen. While there are a few original twists and turns in the film, nearly everything has its origin in the original story. Just a bit of a cut and paste on the storyboard! The main plot change comes when Hallam goes up to work in Edinburgh. Whereas the film has him working in a hotel (and living in the picturesque click tower), the original fiction character works in a charity office encouraging dottering grannies to leave endowments in their (soon to be read) wills to Cancer Research. Hallam’s boss Kate still had a lousy boyfriend in the book (though not married like the film). In the book, Hallam’s journey has a satisfying flow: from home to Edinburgh, and then back home. The finale, set on the estate, has tension and humour as Hallam plots his revenge on his step-mother Verity. I found the book’s Hallam to be much more consistent, more reasonable and more comfortable. The film had slowly twisted him, and given him a complicating edge that the novel didn’t require. So I can now recommend both the novel and the film. A good read for a long journey. Now I wonder what Jinks’ next book Intuition will be like? Having traded two goats for a Leopard upgrade DVD last weekend, I’ve been a bit tardy in getting around to sharing how the upgrade process went. The Mac Mini was new in September – and I’m still a bit annoyed that Apple feel they can refresh their hardware range in September (which inspired the purchase) and then upgrade the operating system the next month but only give cheap upgrades to hardware purchases made in October. Having never quite needed to hack at the command line or install anything more fancy that Office 2004, I expected the upgrade process to be smooth. After all, if Apple can’t test that the Leopard upgrades on a basic out-of-the-box Tiger system, what hope have they for more complicated setups? It took a good hour: the first 30 minutes for the install process to check the integrity of the DVD – felt like it was polishing each bit of data on the DVD – before actually installing the software. Smooth as the fur on a seasonal Sainsburys’ Polar Bear! The mistake was then clicking on the (now black not blue) Apple logo to check for Software Upgrades. I assumed correctly that a few patches would have been issued since the upgrade DVDs were burned. And so three patches were downloaded. The third patch – Login & Keychain Update 1.0 – seems to be the problem patch. It was all ok until the machine restarted, and it got stuck on the way down. Caches necessary for booting are being updated. System shutdown will proceed once the caches are up to date. I waited 10 minutes. I Googled the error message on the still-operational PC for the next ten minutes, satisfied myself that it seemed like a common problem, and held in the power button for the necessary five seconds. On boot, or coming out of sleep, it finds it hard to detect the Bluetooth keyboard. Was never a problem with under Tiger. It’s a little more sluggish – a bit like Vista, XP, Windows 2000, Windows 98, each new OS release seems a bit more bloated (at least in terms of video and memory processing requirements) and slower. Oops. 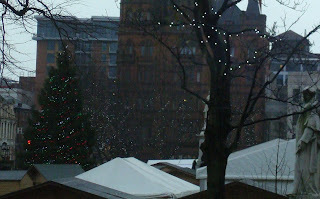 Belfast city centre’s Christmas Tree has formally separated ... from itself. The 45 foot tall Norway Spruce was due to be erected in front of the City Hall in time for the turning on of the lights next Tuesday (20th Nov). But it had second thoughts – blamed on “the wet summer and unseasonally [sic] dry autumn” that “had a devastating effect on the tree”. Anyone living beside Parkanaur in Dungannon will probably hear a man with a large chain saw running through the forest to find a replacement tree that can be trucked up to Belfast. You can follow their progress on the City Hall webcam. Since the upgrade to Blogger last year I’ve stuck with the Classic Templates rather than downgrading to the new-fangled Layouts. But tonight I finally decided to bite the bullet and set up a parallel blog using a couple of recent entries using Layouts to see just how bad it would be to swap across. It does make it easy to add a background image to the blog banner ... though figuring out that 710x118 is the optimum size took a bit of guesswork! There’s no Recent Comments page element. But the last five comments can be extracted by pointing the Feed element to yourblogname.blogspot.com/feeds/comments/default, ticking item dates and sources/authors. Unfortunately, it’s limited to the last 5 items – and can’t even be changed by hacking the HTML (which would probably also break the automatic template). I’ve always been fond of the Rounders layout. But if I go ahead and migrate from Classic Template -> Layout I could quickly become a fan of Denim (or even Stretched Denim that uses the full width of your browser window). So if you notice a few weirdnesses in AiB over the next day or two, please empathise with my pain! Update: It took about an hour in the end. Now to get a good image for the banner. It's been an unusual week for post. 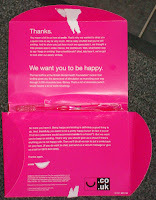 First there was the pink toothbrush that smile.co.uk (an online bank I thoroughly recommend) decided to bestow upon its customers to encourage them to stay happy. And then this morning a table tennis bat wrapped in clear plastic clattered onto the mat. Despite two different people promising to send out an invitation to the launch event for the Mini Clubman around in Bavarian's Boucher Road showroom this afternoon, no invite ever arrived. But at least the Mini marketing department managed to get their mailshot to existing Mini drivers out on the same day as the launch ... and they're right - it's like nothing I've received in the post before! Never one to let the lack of an invitation card stand in the way of a freebie, I headed down to Boucher Road at 2.30pm for the launch. The "unusual" theme stretched to the food on offer in the opulent Bavarian showroom (the big one - not the tiny Mini one up the street). Crocodile and kangaroo meat on skewers sat alongside a bowl of juicy strawberries and a couple of chocolate fountains. And in a surprisingly non-alcoholic drinks table, smoothies sat beside pretty exotic fruit juices. Better say something about the car. 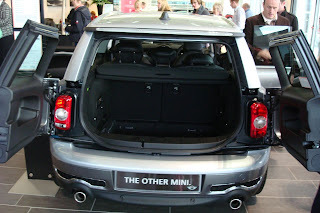 It's basically a slightly longer Mini, which means that the boot is deeper, but no wider. 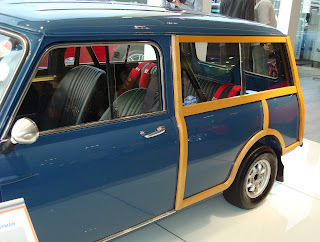 The "unusual" features are the split doors at the back and the little side door behind the drivers door that allows better access for back seat passengers. The boot's a little disappointing. Unless you have a very dinky buggy, don't expect to get strollers or prams into the boot. However, if you've no children or they're a bit older, the boot does look a lot more useful for runs to the supermarket, with space for bottles in the back doors, and a flat boot floor that should make lifting boxes in and out of the boot much easier. They had a beautiful old Mini Countryman on display too - still in use too - along with the PSNI demonstrating satellite tracking of cars by chasing a Mini up and down Boucher Road! 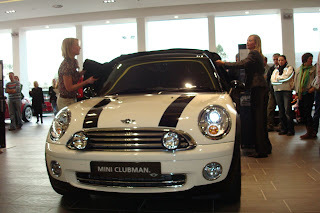 Thanks Bavarian - it was fun ... and I'm still half tempted by the Clubman. 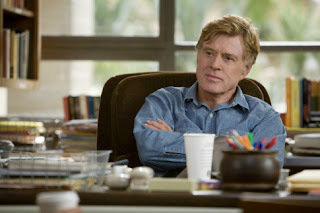 Directed by Robert Redford, Lions for Lambs opened UK wide today. It’s a film that rotates between three linked stories. East Coast US / There’s an ambitious Senator (played by Tom Cruise) who is briefing a veteran TV reporter Janine Roth (Meryl Streep) in his air-conditioned office about his bold new military campaign (more like a giant game of Risk) in Afghanistan. He wants the media to tell his story of “forward operating points” and “not defending democracy through non-violent action” in order that there will be “the public will to win”. Afghanistan / There’s the Special Services soldiers being helicoptered at night into position to capture a high peak before the Al-Qaeda enemy. But their flight comes under enemy fire: Arian (Derek Luke) and Ernest (Micharl Peña) fall to the snowy ground. They joined the army so they would be involved at the centre of the world’s issues, so they could come back and change things. West Coast US / There’s an early morning motivational talk between Prof Malley (played by Redford) and his disaffected political science student Todd (Andrew Garfield). Malley is a liberal idealist, who sees potential in Todd but wants to challenge his lack of engagement and real-world experience. Todd sees that political science is all about the winning and not about the governing. What’s the point? And the same could apply to the US media. They too can be played by the political masters who have learned how to tickle their tummies and make them cooperate. But Janine Roth isn’t any more convinced by the Senator Irving’s rhetoric than she is by the photographs hanging on the walls of his office (Irving + Bush, Irving + Condi, Irving + Powell, etc). Her TV network swallowed the pre-Iraq war facts, to their later regret. They didn’t “connect the dots” and she doesn’t want them to fall into that trap again. But at her stage of career, with her caring responsibilities, hasn’t she been chosen for this “gift” of an exclusive briefing because she is vulnerable and can’t risk not running the story? Prof Malley has identified students with potential before. But lighting the fire under his prize students has sent some off in directions he hasn’t fully approved off. Rather than heading into deliberate social action, or political campaigning, some have surprisingly taken the military route. But tellingly, the pictures on his office walls are of family, not power. As the film explores the triangular relationship between the characters in the three locations, it’s possible (but I think too facile) to immediately write it off as a terribly balanced explanation of the Republican and Democrat set piece positions. An Iraq apologist whose idea of doing “whatever it takes” might even stretch to taking the nuclear toys out of their boxes. A radicalising academic liberal who thinks that it’s important that we reduce the distance between ourselves and reality, that it’s better to fail trying than sit back, earn lots of money and opt out of responsibility. 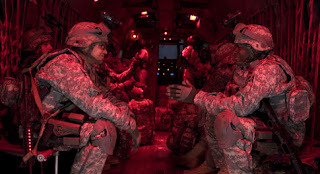 And two soldiers whose acceptance of fate betrays their personal ambitions. There are probably more words in this film than all the other films playing at the Strand! If you cut out the battle scene, you could turn it into a stage play. But for all it’s oratory and argument, the film still ends unresolved. Is the senator really more powerful than the Secretary for Defense? And so ambitious? Yup. Will the reporter go with her instinct or her job security? Ummmm, not so sure. Are the media guilty of “following the majority” in their reporting? And does their eventual questioning of the saccharine-coated government propaganda cost service lives overseas? Will the student turn his back on just having fun in the fraternity and set himself free as an adult in the world? I hope he does. Does the military’s manner of following other people’s orders neuter their individual ability to make a difference in the world? Oh, and what kind of senator has a trouser press in his office? That just leaves the title of the film: Lions for Lambs. Really should be called “Lions led on by asses”, but that would never get past the Hollywood censors! Wikipedia can be trusted (?) to explain how a phrase from the Crimean War was adapted to “lions led by donkeys” used to describe the brave British infantry (lions) of the World War One and to condemn the incompetent and indifferent generals (lambs) who commanded them”, before popping up again in this film. Lions for Lambs is a story that challenges its audience to engage and not just be taken along for the ride. Some reviewers didn’t like it, but I think it’s worth investing an hour and a half of your life to open your mind and think about how you could be earthed in reality. Update: check out Guto Harri's review over on BBC News ... much better than reading my ramblings! Tonight is a story in two halves. The poor half begins in Bennetts – a fine lunch venue at the intersection of East Belfast’s Belmont Road and the Holywood Road. Only snag is that it’s a much less good dinner venue. Starting with an inaccurate drinks order; taking 35 minutes of so in a half-empty restaurant to serve the food; bringing a dairy-free salad with cheese sprinkled on top; forgetting to put the cheese in my cheese burger; taking a second drinks order but not bringing anything, then being reminded and still not bringing anything, and finally puring the drinks but leaving them on the counter, causing one of us to walk across to the bar and carry them back to the table. Unimpressive. And surprisingly so given the usual good service at lunchtime. Update: Forgot to mention that one of the tables had two couples come in and sit at it, and then leave before placing their food order. One lot had order drinks which never arrived, the other just seemed to get bored waiting for attention and wandered out. Not a good sign to be half empty on a Friday night. Also wanted to say that Movies and Mochas closes bizarrely early on a Friday night - refusing to serve us tea/coffee when we got out of the cinema at half nine. Not a glorious night for Belmont catering! 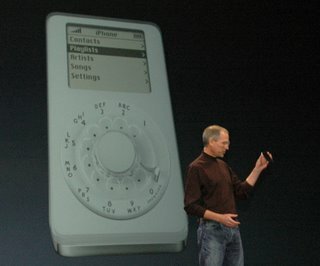 The Apple iPhone goes on sale in the UK tonight at 18:02. Not sure why Apple abandoned their normal on the dot of 6pm launch time, but just after the little hand points to six and the big hand passes 12, the online Apple Store will throw it’s switch and Carphone Warehouse will remove the cardboard hoardings around their display cases. Worth noting that at lunchtime today, there wasn’t a tented village, nor even any kind of a queue of apple-eating enthusiasts with pockets stuffed full of fivers forming outside the Cornmarket Arthur Square branch of Carphone Warehouse. 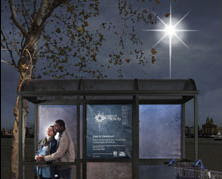 Maybe everyone’s gone to wait in a warm shopping centre like Forestside instead. Or maybe there’s just no interest! Hope the CPW systems stay up today! Update: El Reg reports a lack of interest in the iPhone right across London CPW and O2 stores on Friday night! But it made the point that 21 months ago, there already seemed to be a surfeit of blogs. How much more so now? According to this morning’s Guardian, a recent survey of commissioned by the fine folks at Garlik suggests that 15% of the British web population (ie, the 26 million who actually go online) keep a blog. That makes just under 4 million bloggers in Britain. Did regularly changing your Facebook status count as blogging in the survey? Or did you need to write something more significant? Was the survey really GB or UK? One release suggests that “The total number of GB adults who use the Internet (18+) is 26.58 million (Source: EIAA)”. So if the figures are only for adult bloggers, we could have another half million or more under-18 bloggers out there too? Ryanair’s reputation precedes them. Being in somewhat of a travel lull at the moment, I’ve yet to try out their Belfast City to London flights, so I’ll reserve judgement (and comment). Low cost pervades all aspects of Ryanair, including their marketing department. They don’t use advertising agencies. Instead, staff make up the familiar adverts that they plaster across national and local, often reacting to events in the news or other airline’s misfortunate with jokes, jibes and corny humour. On the 13th August, Ryanair placed the advert reproduced on the right in the Irish News and Belfast Telegraph. It attracted some controversy at the time (though not enough for me to have noticed the news stories) and the Advertising Standards Agency received four complaints. “... noted the ad was topical at the time it was published, due to the well-reported withdrawal of the army regiments back to mainland Britain. We acknowledged that the complainants had found the approach tasteless in the context of the recent political history of Northern Ireland, which had included acts of violence. However, we considered that, in the context of an ad for flights departing from Belfast, the use of the picture of the two well-known Sinn Fein politicians and the reference to the British Army would be understood by most readers as a light-hearted reference to the recent withdrawal of troops from Northern Ireland. None of the complaints were upheld. Expect more locally-focussed ads as Ryanair steps up its routes out of Belfast. If you’ve recently started a blog, you’ll have been through the frustrating process that my wife’s going through tonight. Why has every blog name under the sun already been snapped up on blogspot/blogger? And why do most of them only have a single post (if any) from back in 2002. Is it not time for the Google to trash the unloved blogs? Not the abandoned ones where writers have walked away after a few weeks or months of postings. Just the ones where the entire archive only fills two inches of screen real estate. 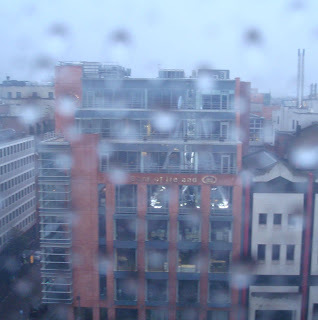 Time for a bit of lateral thinking ... we’ve just eliminated wifeinbelfast dot blogspot dot com! Wonder what it will end up being called? Inspired by a report on last weekend’s Sunday Sequence, and a work colleague talking about it, we finally bought a ticket for something in the Belfast Festival and went along to the Lyric Theatre last night to see the play Truth in Translation. The answer came through the setting up of the Truth and Reconciliation Commission (TRC) to “promote national unity and reconciliation” by pinpointing the “causes, nature and extent” of the violence suffered during South Africa’s Apartheid. Victims and perpetrators came together to tell their haunting stories. Victims of awful abuses and violations could contribute evidence by telling their stories, often for the first time. By collaborating, perpetrators could request amnesty from prosecution if their oral testimony was believed to be full and truthful. 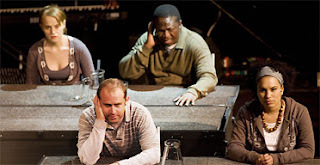 Interpreters were employed across the country to simultaneously translate the first person stories into South Africa’s eleven official languages. And the TRC hearings were broadcast on television and radio so that everyone could hear the truth. Yet caught in the middle of recounting appalling atrocities, dispassionate observation in translation and reporting is impossible. The TRC uncovers a complicated story. The interpreters themselves represent a broad cross section of South African society and experience. They brought their cultural baggage and bias. One was a helicopter sniper who was court marshalled and spent time in prison for refusing to shoot innocent children. Another knows that his father committed crimes as a police officer. The comforter is ever-present, a mother-figure to help witnesses through the experience of testifying. It’s a dark and menacing play, with rapid-fire dialogue that you can’t hope to catch all of. 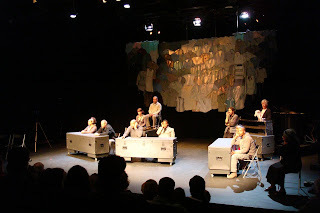 Most scenes include the interpreters simultaneously translating into their specialist language. There’s also fairly colourful language (and those are only the snippets we caught in English!). 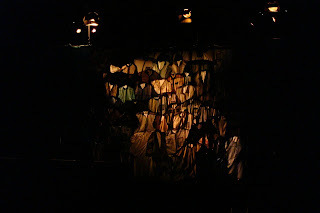 Related snippets of video are projected against a screen of empty shirts: a constant on-screen reminder of death and missing friends and family. Accompanied by a two piece band at the right hand side of the stage, the singing is fantastic. There were a couple of moments when my mind wandered back to the Jerry Springer Opera (a whole different post if you ever want my opinion). The interpreters would break into sweet melodies, yet the lyrics were shocking brutal and vivid, about husbands been blown up and fathers slaughtered. There are moments of levity: there’s a great line about an interpreter working at the dentist ... at the Tooth Commission, and watch out for the impression of Archbishop Desmond Tutu. Yet the dark reality of Apartheid is never far away. When most workplaces decamp to the pub, the guard comes down and colleagues find a way of joking about normally serious work issues. And the same is true for the interpreters. They mock each other, the witnesses, their country’s history. And they struggle to remain uninvolved. Particularly when embarrassed by F.W. De Klerk’s testimony and the circus around Winnie Mandela’s appearance at the TRC. The TRC didn’t tell all the stories. But by airing even just a selection of imperfect examples from the bloody history, no one in South Africa could say that they weren’t aware of their country’s past. And the play raises issues of how well the media can hope to maintain objective and impartial in their reporting when they are faced with stories that run so deep through society’s fabric. It’s an excellent and though-provoking play, no cheap entertainment. I’ve rambled on enough, but before I go for a Lemsip, sitting in the audience last night, I couldn’t help letting my mind wander across to Northern Ireland, and the Consultative Group on the Past (led by Lord Eames and Denis Bradley). As a teenager in the early 1980s, I was unaware of Civil Rights marches and internment. The school history syllabus stopped at the end of the Second World War, and Irish History went no further than Cromwell passing through Lisburn! Northern Ireland was too busy living through the nightly attacks and daily bloodshed to spend a lot of time analysing the start of the Troubles for those of us born into it. And drama like the film Titanic Town wasn’t released until 1999. March 2006 saw Facing the Truth where Desmond Tutu facilitated six televised meetings in Northern Ireland between victims (often widows and families) and perpetrators. But I’m not convinced that a Truth and Reconciliation Commission in Northern Ireland would open up our history as effectively as the South African model. I’m not certain that truth would be forthcoming. And (perhaps sadly) I’m not convinced that there is a widespread appetite to delve back too far into the Northern Ireland scrapbook. There’s a scene near the conclusion of Truth in Translation in which a man who probably still couldn’t swim was teaching others to swim. That seemed curiously positive. You don’t need all the answers to move on. Even to move into areas where you’re not comfortable. quietly forget, overlook even, to stagger into the future. Many happy returns to Channel 4 which started broadcasting to those in the UK who could receive it at 4.45pm back on 2 November 1982. UK basketball shown on a Tuesday (?) night in the early days when the schedule wasn't terribly full and advertisements weren’t too plenty! The little I know about the rules of basketball is a result of Channel 4. Wanted. Back in 1996/7, the show was based around two runners travelling through England, Scotland and Wales for one week on the run from a tracker. The public were encouraged to be on the lookout and phone in leads to help the tracker find them. The runners had to travel a certain distance each day and complete certain tasks, so they couldn’t stay holed up in a friend’s house all week. In an age when video links and outside broadcasts were difficult and expensive, the runners had to spend an hour in a phonebox at the end of the week (during the live show), not that the extra technology bolted onto the phone box and the OB van around the corner made them a sitting target for the tracker! Presented by Richard Littlejohn and KGB defector Oleg Gordievsky (who later received a CGB), the show went on to win a Silver Rose at Montreux in 1997, the same year as Cold Feet won the Rose D’Or. Lost - perhaps the show with the most potential and the least impact. Back in 2001, three two-member teams were dropped off near each other in unknown locations with only a backpack of clothes and their wits to help them. Followed by a cameraman who couldn’t help them (but could often slow them down) they had to race back to London. Successful teams went on to compete in the next race. You can check out the animated C4 logo and relive the original theme music “Fourscore” over at Channel 4 at 25 along with lots of archive shows that are freely available (to PC users!) on 4oD until mid-November. Oh, and a belated happy birthday to S4C which celebrated a quarter of a century of broadcasting in Wales yesterday! 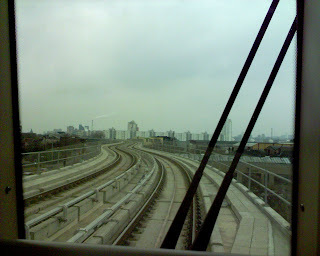 The Docklands Light Railway – which recently celebrated its 20th birthday – is an amazing system running across East London. I’ve used it a couple of times to get in and out of London City Airport. It’s a driverless train – so passengers can sit right at the very front of the train and look up the track. However, there is a conductor on-board – the Passenger Service Agent – and that’s where this sad funny tale begins. While the DLR trains chug up and down the tracks all by themselves, the PSA is on board to deal with passengers at the unmanned platforms, and to assume control (using the locked away controls) should something go wrong. An online report at the Londonist suggests that on Tuesday morning, the PSA of one particular Bank-bound DLR train, was standing on the West India Quay platform waiting for passenger to embark. But rather than stepping on board and then hitting the button to trigger the doors to close and signal to the control system that it was safe to move on to the next stop, the PSA reached in and hit the door close button ... while still standing on the platform. So the doors shut, and the train moved off to Westferry, the next station, where it opened the doors to allow the unsuspecting passengers off the train. And then it dutifully sat at the platform with its doors open, waiting for the non-existent PSA to hit the close button. Thanks goodness nothing went wrong between stations. Update: Docklands Light Railway confirmed the incident. This is a post about an owl ... but it’ll take a while to get to the point! You’d think that within any business or institution the IT community would be at the bleeding edge of innovation. But sometimes they’re so busy deploying other people’s innovations that they don’t quite get around to taking full advantage of it for themselves. The sharp-eyed (or those reading this post) will notice a familiar owl up in the blog’s banner. All of the BBC-badged Acorn computers (BBC Micro, BBC Master, Archimedes 305/310, and A3000) displayed the logo of the BBC’s Computer Literacy Project somewhere on their keyboard ... and it’s good to see it back in use again - even if it is now back to front! Back to the blog ... for the more technically-minded, there’s already a Backstage area that provides information on APIs and feeds for existing BBC services that can be taken and mashed into other applications and widgets. (What a horrible sentence.) Successful prototypes are then showcased, and some might even make their way into properly supported services on bbc.co.uk over time. I particularly like Al Petfield’s World News widget which shows the latest world headlines along with a mark on a revolving globe showing where the story originated.